Lately, things have been a little too quite on the front that is Earth-38. Really, aside from a name-drop over on Black Lightning, we haven’t been given anything to discuss when it comes to Supergirl. Sure, a lengthy hiatus may be to blame, but the folks in Vancouver have been pretty tight-lipped nonetheless. But now, thanks to actress Krys Marshall, that’s somewhat changed. 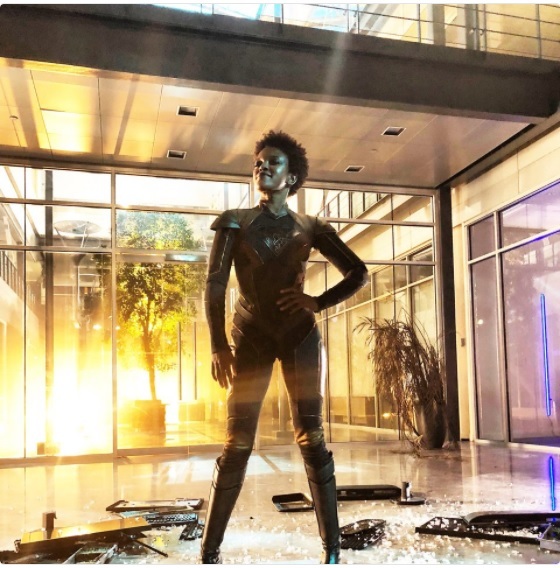 You see, the very woman who’s been tasked with playing the Worldkiller known as Purity has taken to Twitter, showing off her badass Kryptonian threads. As you can see in the picture below, her attire is not all that dissimilar to what’s worn by Reign; it’s just that she’s missing a cape and mask combo. Of course, she may not even require any since much of the principal cast is already in on her secret. But, in Reign’s case, her identity of Samantha has yet to be revealed to Kara Zor-El, Lena Luthor and others, even if we’ve been given hints that it’ll happen before long. Still, there’s a difference between what’s been filmed and what’s yet to air. Of course, we’ll keep you posted as more news becomes available, as Supergirl is expected to return with new episodes on Monday, April 16 on The CW.